In terms of available healthcare and health status Sierra Leone is rated very poorly. Globally, infant and maternal mortality rates remain among the highest. The major causes of illness within the country are preventable with modern technology and medical advances. Most deaths within the country are attributed to nutritional deficiencies, lack of access to clean water, pneumonia, diarrheal diseases, anemia, malaria, tuberculosis and HIV/AIDS. A 2006 national survey found that 84% of the urban population and 32% of the rural population had access to an improved water source. Those with access in rural areas were served almost exclusively by protected wells. The 68% of the rural population without access to an improved water source relied on surface water (50%), unprotected wells (9%) and unprotected springs (9%). 20% of the urban population and 1% of the rural population had access to piped drinking water in their home. Access to an improved water source does not give an indication about whether water supply is continuous. For example, in Freetown taps were running dry for most of the year in 2009. People collected water in containers wherever they can and those who can afford it install water tanks on their houses. Even the fire brigade used its trucks to sell drinking water. There were fights between firefighters and employees of the Guma Water Company, responsible for water supply in Freetown, sometimes resulting in deaths. The 2014 CIA estimated average life expectancy in Sierra Leone was 57.39 years. in 2015, after improvements in health in other poorer countries life expectancy for both men and women was the lowest in the world. Yellow fever and malaria are endemic to Sierra Leone. Sierra Leone suffers from epidemic outbreaks of diseases including cholera, Lassa fever and meningitis. Sierra Leone has a prevalence of HIV/AIDS in the population of 1.6 percent. In 2014 there was an outbreak of the Ebola virus in Sierra Leone. As of 4 August 2014, there had been 691 cases of Ebola in Sierra Leone, and 286 deaths. Mental health care in Sierra Leone is almost non-existent. Many sufferers try to cure themselves with the help of traditional healers. During the Civil War (1991–2002), many soldiers took part in atrocities and many children  were forced to fight. This left them traumatised, with an estimated 400,000 people (by 2009) being mentally ill . Thousands of former child soldiers have fallen into substance abuse as they try to blunt their memories. There is one primitive psychiatric facility in Sierra Leone. It is estimated that there are about 450,000 disabled people in Sierra Leone, though number could be an under-estimate. Common disabilities in Sierra Leone include blindness, deafness, war wounded, amputees and post-polio syndrome. Maternal mortality statistics in Sierra Leone are among the world's highest. One in eight women risks dying during pregnancy or childbirth. The 2010 maternal mortality rate per 100,000 births for Sierra Leone is 970. This is compared with 1032.7 in 2008 and 1044.2 in 1990. The under 5 mortality rate, per 1,000 births is 198 and the neonatal mortality as a percentage of under 5's mortality is 25. In Sierra Leone the number of midwives per 1,000 live births is 1 and the lifetime risk of death for pregnant women 1 in 21. Discrimination based on HIV status is illegal, but HIV-positive people are highly stigmatized, with HIV-positive children being denied schooling, adults denied jobs, and abandonment by families common. Persons with HIV are often driven to suicide. ^ "Sierra Leone country profile - BBC News". Bbc.com. 2016-01-21. Retrieved 2016-10-30. ^ a b c "Estimates for the use of Improved Drinking-Water Sources" (PDF). Sierra Leone: WHO / UNICEF Joint Monitoring Programme for Water Supply and Sanitation. March 2010. Archived from the original (PDF) on 26 December 2011. ^ a b c Nataliya Pushak; Vivien Foster (June 2011). "Sierra Leone's Infrastructure. A Continental Perspective" (PDF). Policy Research Working Paper 571. World Bank. pp. 31–35. Retrieved 6 August 2011. ^ "CIA - The World Factbook Life Expectancy". Cia.gov. Retrieved 2014-06-25. ^ "UN: Life expectancy worldwide has increased by 5 years". Calgary Herald. 18 May 2016. Retrieved 19 May 2016. ^ a b "The Primary Health Care Hand Book Policing". Ministry of Health & Sanitation. 2007-05-25. Archived from the original (doc) on 2008-02-17. Retrieved 2008-01-24. ^ "2006 Report on the global AIDS epidemic". UNAIDS. 2006. Archived from the original (PDF) on 2008-01-17. Retrieved 2008-01-24. 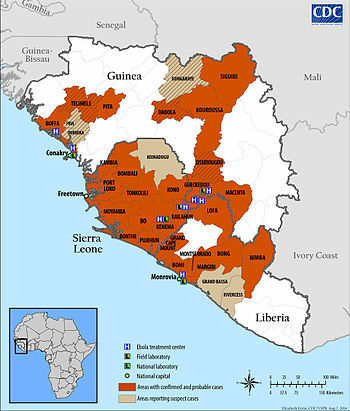 ^ "Ebola virus disease, West Africa – update 6 August 2014". Archived from the original on 8 August 2014. Retrieved 29 September 2014. ^ a b "2010 Human Rights Report: Sierra Leone". US State Department. Retrieved January 12, 2013. ^ a b c Government discussion turns to issues of the disabled in Sierra Leone. Jhr.ca. Retrieved on 2011-03-13. ^ Moszynski, P. (22 September 2009). "Sierra Leone's maternal mortality rate is a "human rights emergency"". BMJ. 339 (sep22 2): b3908–b3908. doi:10.1136/bmj.b3908.